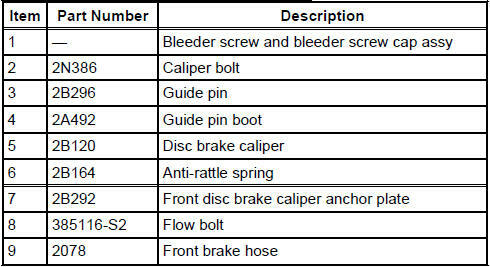 bolts to the front disc brake caliper anchor plate (2B292), which bolts to the front wheel spindle (3105). is a pin slider, dual piston design. are of a ventilated full-cast design, with non-directional cooling fins. 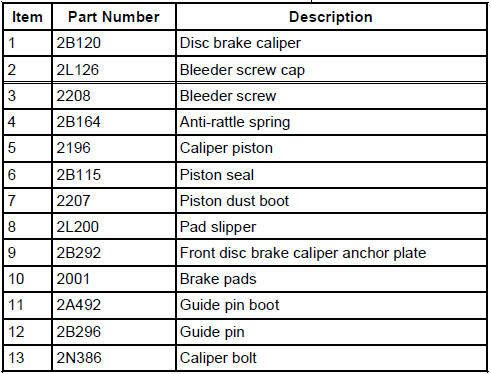 are serviced with the disc brake caliper and front disc brake caliper anchor plate removed. is riveted to the front wheel spindle. protects the front wheel bearings and inboard surface of the front brake disc. are housed in the front disc brake caliper anchor plate. are of a non-asbestos, non-metallic composition.